Order securely by credit card! Is destination a business or residence? Note: orders to Alaska and Hawaii take 2 days, regular 1-day rate applies. No extra shipping charge when gifts are ordered with pasties. be mixed in packages of 4, 6, 12, or 24. "REAL Pasties - Like Mom used to make - Delicious!" - The Pasty Cam, a daily glimpse of life in the U.P. - Just how are these beauties built? - Almost good enough to eat! 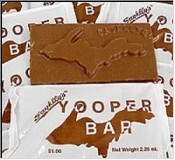 Enjoy a sweet piece of the U.P. Yes. I would like to receive Pasty Central update emails.